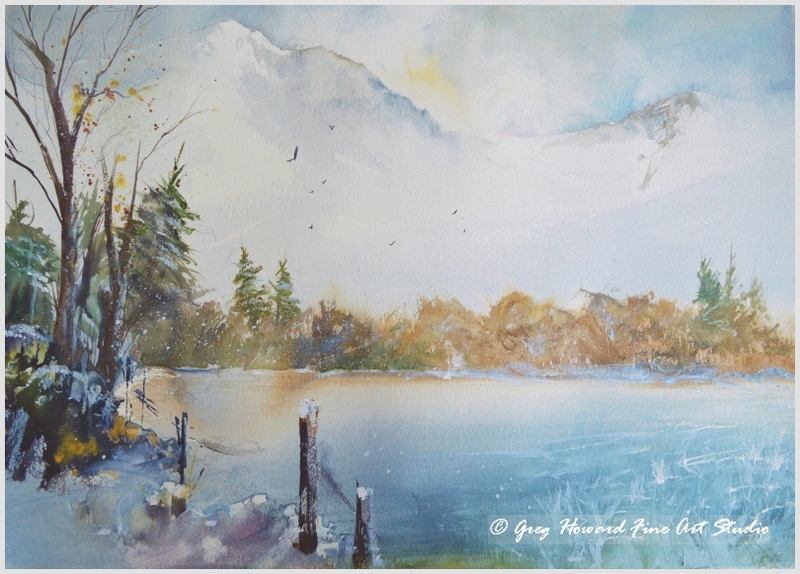 Title: Frozen Tarn III - This is an original painting by U.K watercolour and soft pastel artist Greg Howard. Title: Frozen Tarn III – This is an original painting by U.K watercolour and soft pastel artist Greg Howard. You often hear the term “winter wonderland” bandied about, especially in the run up to Christmas where it seems anywhere that has a Christmas tree and some fake snow is deserving of the term. Anyway (rant over) I thought it might be interesting to put on paper what I would term a winter wonderland in its more literal context i.e. actual snow, lots of fir (Christmas) trees and a for a bit of extra sparkle a frozen lake and some snow covered mountains. Here’s what I came up with. The original watercolour painting is 690mm x 490mm and is available either framed or unframed. Be the first to review “Frozen Tarn III” Click here to cancel reply.